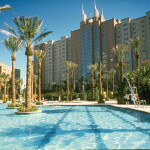 Discover a resort hotel where the beating heart of the Las Vegas action pans out before you at Hilton Grand Vacations Suites on the Las Vegas Strip. Situated at the north end of the Strip, this Las Vegas hotel offers a non-gaming, family refuge in the 24-hour city, with the comforts of home in the heart of Vegas. 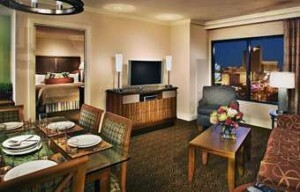 Hilton Grand Vacations Suites on the Las Vegas Strip offers tranquility alongside the bright lights of the Las Vegas Strip and within easy reach of downtown. Spend time in the natural marvels of nature at Red Rock Canyon and with the man-made marvels of the Strip. Enjoy spectacular shows and quiet family time. 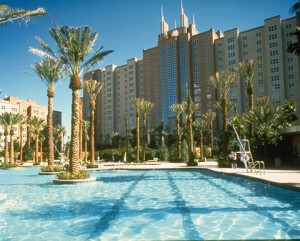 Refresh under Vegas sun in the outdoor pool at Hilton Grand Vacations Suites on the Las Vegas Strip. Enjoy light meals and long drinks poolside at Waves Pool Bar and Grill. Maintain any exercise routine during your stay by making use of the contemporary cardio and weight machines in the fitness center. The gas barbeques at poolside make a great spot for family fun, with cookouts bringing the whole resort hotel community together. The Marketplace Deli stocks American favorites and proudly brews Starbucks® coffee. 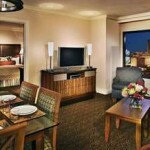 Host your event at Hilton Grand Vacations Suites on the Las Vegas Strip. 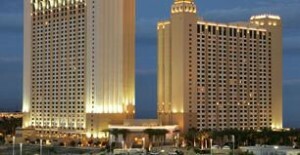 The hotel business center offers AV rental to make presenting easy, and the attractions of Vegas make for the ultimate corporate getaway. The Oak and Mahogany function rooms are elegant venues for family celebrations and private dining.